As we all know a pump is just as good as its installation, so if you need a new pump then you need not only a good brand, but a company that will give you a meticulous pump installation. If you need professional Pump Installation services in NYC, the installation technicians at NY Pump & Motor Repair are here to give you a thorough installation that will maximize the efficiency of your pumping system. Not only are we one of the leading Pump Installation Service provider for big companies such as Home Depot, Lowes and WW Grainger, but we have been a trusted pump installation company for many satisfied customers since 1941. We carry the most popular pump brands, such as: Goulds, Armstrong, Bell & Gosset, Grundfos, Federal Pumps, Taco, Liberty Pumps, Berkeley, Sta-Rite, DB, Tsurumi, Dayton, and more. At NY Pump & Motor Repair we are committed to customer satisfaction making sure your new pump system installation is done with up most care and attention to detail, to maximize the lifespan and efficiency of your new pump. So whether you need new heating pumps, water pressure boosters, sewage ejector pumps, or any other commercial pump types, you can count on NY Pump & Motor Repair for your professional Pump Installation in NYC and the Tri-State area. Pump maintenance is vital for the efficiency and life of your pumping system. If you need professional Pump Maintenance services in NYC, NY Pump & Motor Repair is a wise choice. Our pump maintenance technicians are fully qualified to keep your pumps in good condition, catching any problems before they become serious. At NY Pump & Motor Repair, we offer our pump maintenance services for heating pumps, water pressure boosters, sewage ejector pumps, or any other commercial pump type. Since 1941 we have been maintaining pumps for many well know companies in NY and the Tri-State area, with our trusted reputation for excellence. We offer constant inspections, making sure your pump system is up and running at its optimal level of efficiency in order to increase service life and lower your operating costs. At NY Pump & Motor Repair, our pump maintenance technicians are here to improve the reliability and the bottom line profitability of you pumping mechanisms. So if you need Pump Maintenance in NYC then NY Pump & Motor Repair is here for you. Because a pump is such a intricate mechanism, pump rebuilding is a service that takes skill and years of experience. Not just any Pump Rebuild company is qualified to accurately and effectively rebuild your pump. If you need professional Pump Rebuild services in NYC, then NY Pump & Motor Repair is the place for you. Since 1941, our professional pump rebuild technicians at NY Pump & Motor Repair have been providing high quality pump rebuild services in NYC for many businesses with a variety of services for heating pumps, water pressure boosters, sewage ejector pumps, or any other commercial pump types. Aside from our regular pump rebuild service we also offer a 24/7 emergency service, getting your pumps up and running promptly for your piece of mind. Over the years, our professionals at NY Pump & Motor Repair have gained our reputation for high class efficient pump rebuilding among the many other pump services we offer. So if you need a pump rebuild in NYC you will not regret choosing NY Pump & Motor Repair. If you need professional Pump Replacement services in NYC, our professional Pump Replacement technicians at NY Pump & Motor Repair are at your service. Since 1941 we at NY Pump & Motor Repair have been providing high quality Pump Replacement services for heating pumps, water pressure boosters, sewage ejector pumps, or any other commercial pump type. Whether you need emergency Pump Replacement or just looking for a Pump Replacement part we carry pumps from large a variety of the leading pump brands. 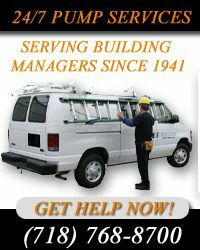 We are one of the leading service centers for many big companies in NY, servicing all types of buildings including real estate management companies, commercial bakeries, woodwork shops, hospitals and municipalities. We have also provided pump repair services to the NYC Housing Department, Parks Department, Department of Education, Archdiocese of NY, and countless other private firms. At NY Pump & Motor Repair, along with our vast amount of experience, we only use up to date, state of the art equipment and methods to give you the pump replacement service that you deserve. So if you need Pump Replacement services in NYC or the Tri-State area, NY Pump & Motor Repair is the place to go. If you have a pump problem then you will need a pump repair service that you can count on. For pump repair in NY, NY Pump & Motor Repair is a trusted choice. At NY Pump & Motor Repair, we are highly experienced at providing buildings with a variety of pump services for heating pumps, water pressure boosters and sewage ejectors since 1941. Whether you need a pump installation or pump repair, our professionals can work with pumps from most major manufacturers. At NY Pump & Motor Repair we are a leading Pump Repair Service provider for Home Depot, Lowes and WW Grainger. Trusted by the big guys you can be rest assured that NY Pump & Motor Repair will meet and even exceed your expectations. With our headquarters located in Brooklyn, our Pump Repair experts can provide prompt Pump Repair services in Manhattan, Queens, Staten Island, the Bronx, Long Island, as well as the rest of the tri-state area. We provide 24/7 emergency pump services for your convenience. So if you need pump repair in NY give us a call and we'll have your pump properly functioning in no time. Whether you are having problems with your heating pumps, water booster pumps, sewage ejection pumps, or any other pump and motor problems in NY, you can count on NY Pump & Motor Repair to come to you rescue. Pump & Motor Repair is a family-owned pump repair company providing quality pump and motor installation and repair services to the tri-state area since 1941. whether your tenants or employees are complaining about a lack of heat or water pressure or any other problem, you can trust the experts at Pump and Motor NY, to come promptly 24 hours a day 7 days a week. We will inspect your pump and determine the fastest and most reliable solution to your problem, whether you need a repair or an entirely new pump. If you you need a replacement we will provide affordable wholesale replacement for your pumping unit. At Pump and Motor NY, we use the most up to date repair methods and technologies with our state of the art tools and equipment to give you quality pump installation and repairs. So if your having a pump and motor issue in NY, Pump and Motor NY is at your service. Does your Sewage Ejection Pump need service in NYC? Meet the experts. NY Pump and Motor Repair has been providing the New York area with excellent sewage ejector pump services for over 70 years. You can trust NY Pump and Motor to be there promptly and get any job done professionally and efficiently. We also provide round the clock emergency service so that in a bad situation, you will never have to wait overnight. Sewage Ejector Pumps are generally found in basements or wherever there is plumbing that is located below ground level. It is an essential part of the plumbing system for many homes and buildings as it is the only means to pump sewage and waste up to ground level and out into the main sewer. When the sewage ejector pump is not working, toilets, as well as other drains on that floor level, will begin to back up. If your sewage ejector pump is malfunctioning it will render the bathrooms on that floor level unusable until repaired. A family company, NY Pump and Motor Repair knows how important it is to get your plumbing system back to functioning quickly and completely. A sewage problem is not one you want to have! Our experts will arrive promptly to inspect the problem and let you know what is the fastest and most cost efficient way to fix it. So call today, to get us on the case for any sewage ejection pump service in NYC.